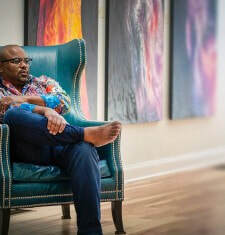 Lenny Bazemore is an intuitive American-born visual artist and business owner. Lenny gains inspiration for his paintings from his experiences while visiting different parts of North America, Asia, Europe and the Caribbean. Lenny has always believed that life is not about finding yourself… it is about creating yourself, and that the right living or working environment enhanced with inspiring art helps you create an even better you. Lenny has consistently shown a good eye for aesthetics through his art and design projects. During a trip to China in 2012, he was most fortunate to consult with Feng Shui Master Wang Xun. Mr. Xun taught Lenny how to create balance for interior and exterior space with the use of color, materials and placement. He intuitively uses this method to create synergy in his paintings and design projects. Owner and Director of The Bazemore Gallery in Manayunk, PA, Lenny is an active member of the Manayunk business community and owns several commercial properties in the area. He also owns Philadelphia’s latest health conscious eatery, the soon to open Juice Bar and Cafe called The Juice Merchant.